There are several different transfer options between Lyon Saint Exupery Airport (LYS) and the Lyon-Rhone Alps region. Trains, taxis, shuttles buses and limousines are all available directly from the airport. The terminals are located just off the A432 junction. High-speed trains connect the airport with major towns and cities around the region and across France and beyond. The airport's TGV station is located between the short-term and the long-term parking areas. A few of the destinations you can reach by train include Paris' Gare de Lyon, Marseille and Montpellier. Call: +33 8 3635 3535 for more information. There is an extensive shuttle bus network providing regular and reliable services throughout the Rhone Alps region. Shuttles run between the airport and Lyon every 20 minutes from 05:00 to 23:40. Shuttle bus services are operated by Satobus and their desk is situated in the connecting hall between the two terminals. For more information you can call Satobus on: +33 4 7268 7217 or consult their website for current timetables at: www.satobus.com/welcome.html. 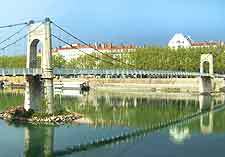 Many of the main accommodation providers in the area surrounding the airport can arrange courtesy customer pick ups and drop offs at Lyon Saint Exupery Airport. It's best if you arrange these services with your hotel prior to your arrival for maximum convenience. Limousines are provided by Chabe-Verjat Limousine Service. You can arrange for a limousine in advance of your arrival by calling: +33 4 7256 5181. Taxis depart from outside the Terminal 1 building 24 hours a day and provide quick and convenient access to Lyon and other destinations in the vicinity. More information is available by calling: +33 4 7855 3431.